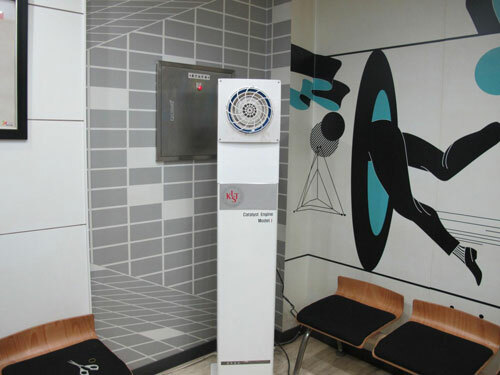 (Nanowerk News) The research team led by Dr. Jongsoo Jurng and Dr. Gwi-Nam at KIST stated that, "In cooperation with KT&G, KIST has developed a nano-catalyst filter coated with a manganese oxide-based nano-catalyst, which can be used in a smoking room to reduce and purify major harmful substances of cigarette smoke. the KIST-developed catalyst removes 100% of the particle substances of cigarette smoke, such as nicotine and tar, converting those into water vapor and carbon dioxide. According to the research team, the air cleaning equipment based on the newly-developed catalyst can purify over 80% of the cigarette smoke within 30 minutes and 100% of it within 1 hour in a 30 square meter smoking room, where 10 people are simultaneously smoking. The research team has developed a nano-catalyst filter by evenly coating a manganese oxide-based (Mn/TiO2) nano-catalyst powder onto a ceramic-based filter media. The nano-catalyst filter uses a technology that decomposes elements of cigarette smoke using oxygen radical, which is generated by decomposing ozone in the air on the surface of the manganese-oxide-based nano-catalyst filter. An evaluation test with total volatile organic compounds (TVOC), such as acetaldehyde, nicotine and tar, which account for the largest volume of gaseous materials in cigarette smoke, is conducted to evaluate the performance of the newly-developed catalyst. The results show that the new catalyst decomposes over 98% of the aforementioned harmful substances. The lead researcher Dr. Jurng mentioned that "this research holds a significance since the new air cleaning equipment based on a simple catalyst successfully processes and removes gaseous materials in cigarette smoke, which are not easily removed with the existing air cleaning technologies. If the new equipment can be simplified and is economically feasible, it will be an important tool for keeping smoking room pleasant and clean. Also, from the convergence perspective, the new nanometer catalyst filter can be integrated with other air cleaning products such as air purifiers and air conditioners." 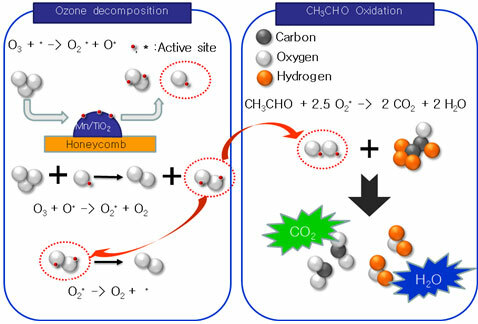 Ozone (O3) decomposition method using a catalyst can be utilized as a permanent decomposition technology. When O3 interacts with a metal oxide (Mn/TiO2), O3 is decomposed by the following reactivity formula on the surface of manganese, generating reactive oxygen species, i.e., oxygen radical. The right side of the figure below shows the oxidation process of acetaldehyde (CH3CHO), a substance that accounts for the biggest portion of gaseous materials in cigarette smoke. Acetaldehyde is oxidized and turns into innocuous CO2 and H2O by reactive oxygen species generated in the O3 decomposition process. Other VOCs go through similar oxidation reaction. Catalytic oxidation is known to have high efficiency to oxidize and convert organic substances into innocuous final oxides such as CO2 and H2O. Particularly, with a manganese (Mn)-based catalyst, ozone is decomposed to produce oxygen radical as a reaction intermediate. The oxygen radical is a chemically reactive molecule, which includes oxygen atoms. It has high oxidizing power with high reactivity, and is reported to be effective to process pollutants in the air. Oxygen radicals that fail to react with pollutants are joined together after reaction and are converted to innocuous oxygen (O2) before being discharged into the surrounding. Oxygen radical is an oxygen atom in the atomic state prior to being combined into a molecule. Total volatile organic compounds (TVOC) is a comprehensive term referring to liquid or gas phase organic compounds that are vaporized into the air at the room temperature. TVOC is known as a carcinogen that can cause disability in the nervous system from skin contact or from inhalation through respiratory organs.